For a long time I was perfectly happy to use a good old fashioned bubble level for my projects, that was until somebody gave me a self leveling laser level to try. They are just one of my essential tools that make it so much easier to use around the house. I couldn't imagine going back to the old way of doing things. Over the last few years I have used several different laser levels. Depending on what you are looking to use the line leveler for, will determine which one will be the best option for you. I've taken a few choices here and give you some feedback that the home improvement community has provided. This information can lead you to the right one that may even save you a little money. I found that of all the line lasers that I tested the Dewalt was the easiest to use. This was largely because of the one button operation that did not require going through a whole bunch of menus. The accuracy was quite good, the tolerance is advertised at 1/8 of an inch over thirty feet which seems about right. The Dewalt laser level seems to be durable and well built so I have no doubt that it will last for many years. My only complaint is that the laser can be a bit hard to see if you are using it one sunny days. Despite this issue I still found it to be the best laser level that it tried. I really liked the fact that this line laser works in three planes and gives a full 360 degree coverage. This really makes it a lot easier to keep everything level. The laser is very accurate and very bright so you should have no trouble seeing it even on the brightest days. The Bosch laser level is solidly built and should last for a long time. It self levels and there is an alarm that beeps if it is not level, in fact one minor complaint that I have is just how loudly it beeps when it is not level. The only other thing I can complain about if the cost, this is an expensive line laser but a very good one and well worth the money of accuracy is important to you. 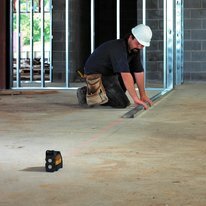 With five laser beams the Johnson line laser certainly makes it easy to get everything into alignment. I found this level to be very easy to use, mainly because it could be rotated by 360 degrees. This allows you to mount the level in place and then you can make adjustments by turning the laser while not having to move the base. The multi purpose tool seems solid and well built so durability should not be an issue. One complaint that I do have is that it does not seem to be as accurate as the manufacturer claims. They say it is accurate to a quarter inch at a hundred feet but this does not seem to be the case. To be fair it does seem about as accurate as the other line lasers that I tried, the problem is that the manufacturer claims that it is more accurate which does not seem to be the case. Despite this I still found it to be a pretty good line laser and well worth the money. I have to say that I am not really sure what to say about this line laser. It is a good quality tool to be sure, it just seems to fall into a middle category that I am not sure there is a lot of need for. The only real difference between this line laser and the other Dewalt one that we reviewed earlier is that this one has a 3 beam laser rather than just horizontal and vertical. While this is certainly useful for keeping things in alignment it comes at twice the price. I am not at all sure that it is worth it. On the other hand unlike the other three laser levels we reviewed it does not offer 360 degree coverage, instead each laser covers ninety degrees. For most people admittedly this is not a huge problem but there will be uses for which it can be an issue. Basically this tool costs twice what the 2 beam line laser does and about half what a line laser that covers 360 degrees would cost. I am not sure that there is a lot of need for this, you would probably be better off deciding that you don’t need the 3 beams and going with the cheaper option or spending the extra money for the full 360 degree laser. All of that being said it is a good quality tool so if you think it would be useful it could be well worth buying. The most interesting feature of this line laser is that it is the only one that I have tried that has a rechargeable battery. Admittedly these things don’t go through batteries all that quickly but it is still nice to not have to buy replacement batteries. I found the Milwaukee laser level to be very accurate and easy to use. Like all of their tools it is well built. A couple of minor complaints that I had were that the out of level indicator is only visual, most others make a sound when they are out of level. The other issue was the magnet which does not hold the laser in place all that well. Beyond these issues it is a good quality laser level.